The best deal in usenet is back! For the next 2 days we’re selling our 1 TB blocks for just $40! Terabyte Tuesday will last for 2 days, from 12 AM EDT on May 26 until 11:59 PM EDT on May 27. Existing block customers can login to our website and click Add Block. Want To Know About Future Promotions? Join one (or both) of our mailing lists, depending on your interests. We respect your privacy… so no spam, ever. Join our Terabyte Tuesday mailing list if you want to be the first to find out about Terabyte Tuesday and our other awesome promotions. Join our Happy Hour mailing list if you want to be notified about our lightning sales, where we offer a deep discount for a couple of hours, 3-4 times per month. The sale runs from 12 AM EDT on May 26 until 11:59 PM EST on May 27. No sale prices will be honored after the sale expires. The sale price is available to both new and existing customers. Sale only applies to 1 Terabyte (1000 Gigabyte) accounts. You are free to purchase multiple 1 TB blocks if you choose. Coupons (new or existing) do not apply to special rates on Terabyte Tuesday. For the next few days our super-popular 500 GB usenet blocks are on sale for just $35 (regular price is $45)! 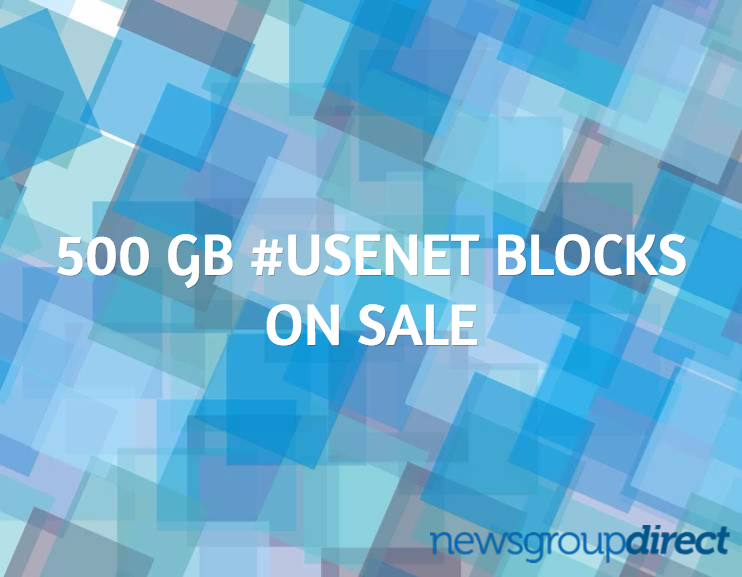 Don’t miss this opportunity to stock up on usenet blocks at a great price. New customers should visit our Deals page: 500 GB Usenet Blocks – $35 each. Existing customers should login and click Add Block. The sale runs until 11:59 PM EST on May 16. No sale prices will be honored after the sale expires. Yesterday we unveiled a major change to our block usenet pricing. All of our blocks are now cheaper than before, significantly cheaper. 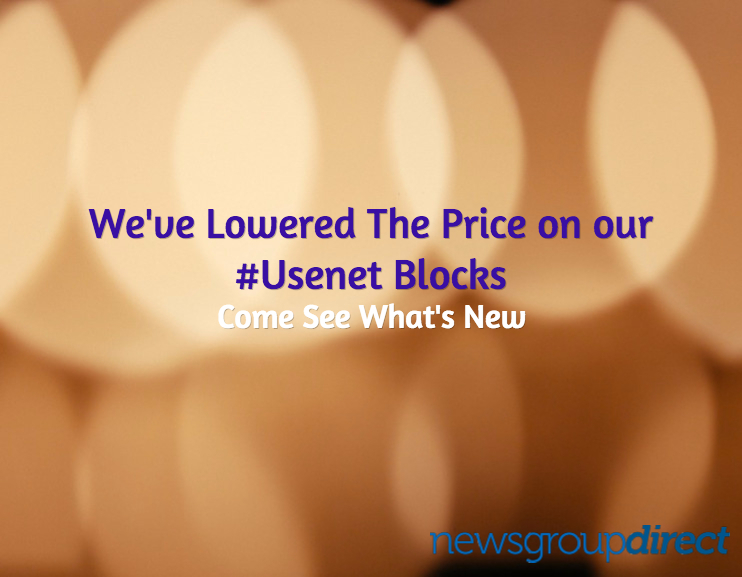 Now you can buy NGD usenet blocks more affordably than ever before. Head on over to our pricing page to see the new prices. Everything works the same as before. Block customers can login and Add a Block at the new, reduced prices. 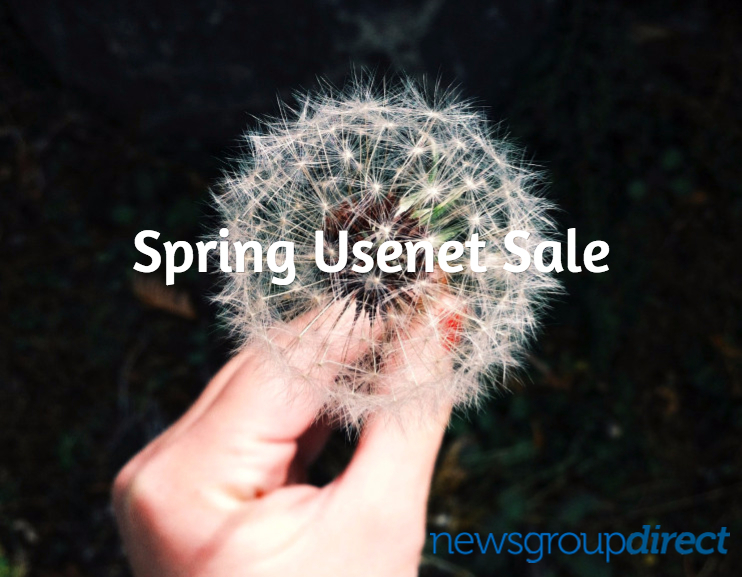 The 2nd part of our Spring usenet sale is now live! This time we’re offering up our 2 TB usenet blocks for $70 (regular price is $200!). New customers should visit our Deals page: 2 TB Usenet Blocks – $70 each. The sale runs until 11:59 PM EST on April 24. No sale prices will be honored after the sale expires. Do you have a favorite newsreader that you rely on? What about a favorite nzb client? 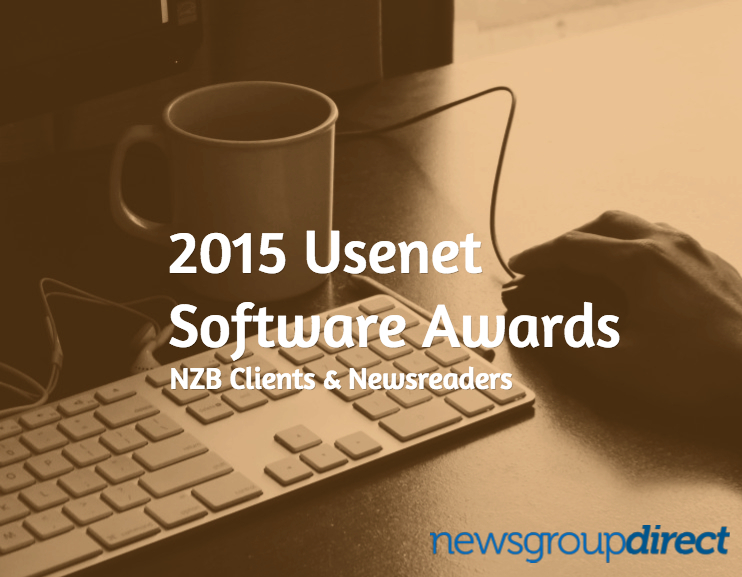 This is your chance to nominate your favorites for the first annual NGD Usenet Software Awards. Our goal is to create a comprehensive list of NewsgroupDirect users’ favorite usenet software. We’re taking nominations in 2 categories: NZB clients and Newsreaders. Once all the nominations are in we’ll compile all the data and determine the favorites for each category. We’ll present the winners for each category as well as the favorites in an upcoming post. Just fill out the quick 3 question survey. Nominations are open through April 15. We need to come up with a proper name for these awards, so leave your suggestions in the comments. Softies? Netties? Thanks to our fantastic customers we sold out of the yearly unlimited with VPN accounts that were on sale last week quite a bit earlier than we expected, so we’re going to go ahead and launch our Spring Usenet Sale. The Spring Sale will be in 2 parts, the first of which launches today. We are bringing back our old yearly unlimited accounts (without VPN access) for just $75/year. We’re also selling our monthly unlimited + VPN accounts for just $12/month (regularly $24.95). Our yearly unlimited usenet accounts are a great upgrade option for block account customers. You pay for a year at a time and don’t have to worry about how much of your block you have left. Classic Yearly Unlimited – $75/year. Unlimited Usenet + VPN – $12/month. If you have a NewsgroupDirect block account and want to upgrade then you should contact us and tell us what you want to do. Current subscribers aren’t eligible for this promotion. The sale runs until 11:59 PM EST on April 10. No sale prices will be honored after the sale expires. Current monthly usenet subscribers are not eligible for this upgrade. We’re having a rare sale on our unlimited usenet accounts! Through April 10 we’re selling our famous unlimited usenet accounts (with VPN access included) for just $111. That’s a savings of over 50% on the regular price of $249.95. If you aren’t currently a NewsgroupDirect customer then you should visit our usenet deals page to purchase. The best deal in usenet is back! For the next 2 days we’re selling our 1 TB blocks for just $40. That’s a savings of $60 per block. Terabyte Tuesday will last for 2 days, from 12 AM EST on March 24 until 11:59 PM EST on March 25. The sale runs from 12 AM EST on March 24 until 11:59 PM EST on March 25. No sale prices will be honored after the sale expires. The sale price is available to both new and existing customers. Sale only applies to 1 Terabyte (1000 Gigabyte) accounts. You are free to purchase multiple 1 TB blocks if you choose. Coupons (new or existing) do not apply to special rates on Terabyte Tuesday. All blocks receive a 10% allowance for headers, so a 1 TB purchase will actually give you 1.1 TB, or 1,100 GB.